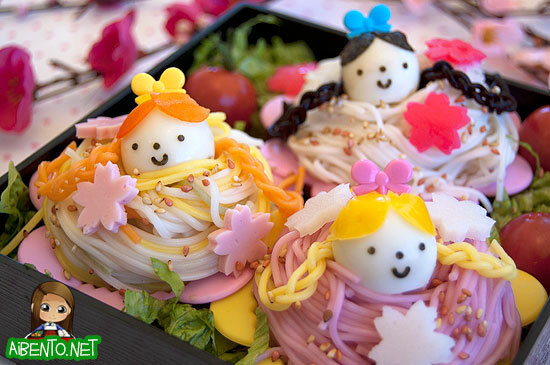 Since Girl’s Day is just around the corner (March 3rd), it’s time to start busting out the girly girl bentos! I should have started earlier so that people could have more ideas, but I got lazy over the weekend after the laundry pile wiped out my motivation to accomplish anything. Since part of my girly food purchases included two colorful bags of somen noodles, I figured a somen bento was in order for today. 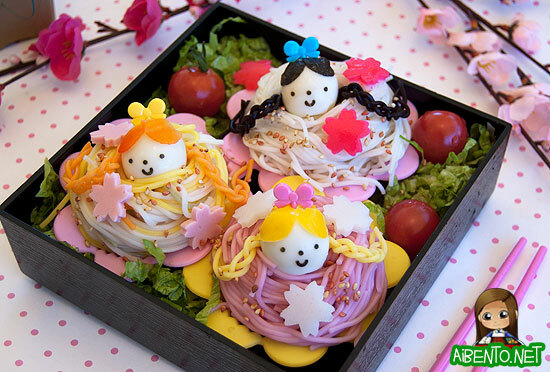 I made three somen “cupcakes” of three different colors: white, rainbow, and pink (ume). On each cupcake is a little quail egg girl, who I’ve named after some Lost characters: Ginger, Blondie, and Tokyo Rose. Do my old Lostie readers remember who these girls would be? I’m ashamed to admit that I forgot to take process photos, so instead I’ll have to just entertain you with various shots of the girls. Here’s Blondie! Her bangs are made out of bell pepper skin and her braids are made out of yellow somen noodles. 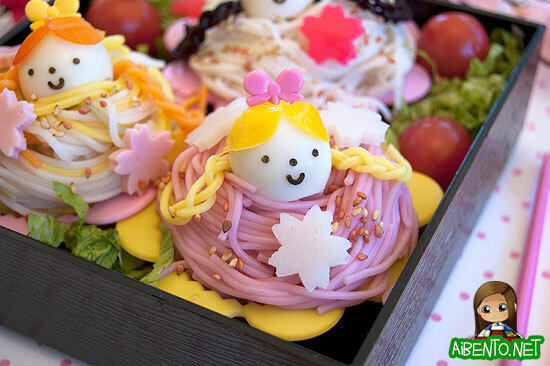 The white sakura blossoms on her cupcake are cut from kamaboko. As you can see, I also found pink and white sesame seeds. Isn’t that cool!?! 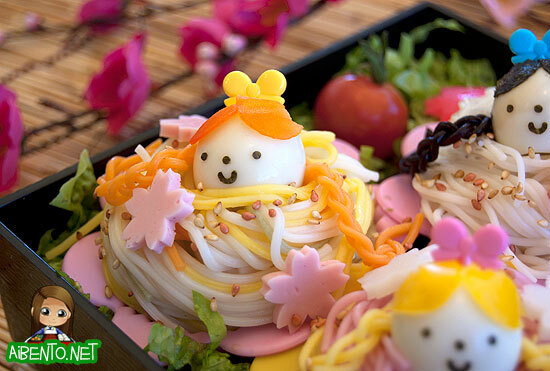 Here’s Ginger, who sits on top of a rainbow somen cupcake with orange somen braids, red bell pepper bangs (looks orange! ), and fish sausage sakura blossoms. 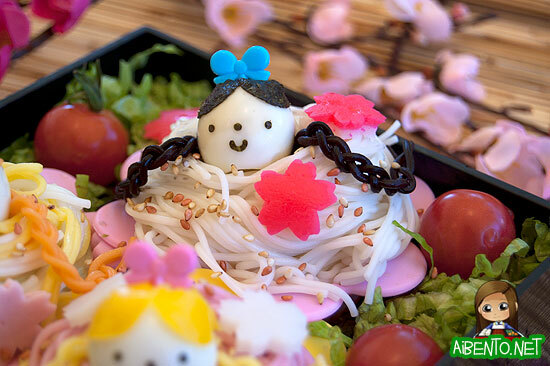 Here’s Tokyo Rose, with black somen (dyed with food coloring) braids, nori bangs, and pink kamaboko sakura blossoms. Underneath the lettuce I have some thinly sliced deli ham and then I added three backyard tomatoes for red color. Because of the somen noodles, eggs, and meat, this lunch is a rather hefty 13 points, but it’s very fresh and healthy so I’m happy with it. Here’s a closeup shot of all three of them again. I hope the ume somen tastes awesome, as it came in a HUUUGE package. Social Moms is having a little blogging opportunity right now to help promote the new movie Mars Needs Moms, so I’m going to write up a list of ten things my kids would miss about me if I were to be abducted by martians and hopefully I can get a $25 Amazon gift card. Having been a big fan of the movies since I was a little kid, it’s been hard not being able to watch the Oscars for the last six or seven years because it makes me feel so old and out of it when I don’t even know what movies people are talking about during Oscar season. This year was one where I was finally able to pay attention to the race and now that my two runts are a little older, I could watch it with them. Baby Girl: Who’s Tom Hanks? Baby Girl: Who’s that?? I know her!! Me: Her name is Sandra Bullock. Baby Girl: Who’s Sandra Bullock? It went on and on and on with Morgan Freeman (the President in Deep Impact), Hugh Jackman (Wolverine), Gwenyth Paltrow (Pepper Pots), etc. Eventually they went to bed and I got to watch it alone, but it was actually quite fun while it lasted. If I were to be abducted, I don’t think Mr. Pikko would know which movies they’ve seen actors in as much as I would. I’ve come to that horrible point in my daughter’s eating career where, in order to get something into her stomach before school without finding soggy bowls of uneaten cereal or having to cook and get them ready for school, I let my daughter eat mac & cheese for breakfast. Don’t judge me! I need her to put calories into her body!! ; ; Daddy does not approve. On the nights where I’m giving the kids a bath, we have this game that we play when I give them their nightly gummy vitamin. There are three different colors and once I put it in their mouth they have to taste it to see if they can figure out what color is in their mouth. Guess wrong and I say, “EHHH!” If they can get it on the first guess, I’ll give them a “ding-ding-ding!”. On the second guess, “ding-ding!”. If they can’t get it by then they get nothin’. This little game is exclusive to me. Mr. Pikko has his own games. I’ve started reading the first book of the Lemony Snicket’s series to Baby Girl and once one parent starts a long book with a kid, the other tends to stay out of it because it’s just kind of rude to pick up something that takes that much verbal effort and “steal” chapters of experience. She’s been digging the book because she remembers the movie. My abduction would be its own type of unfortunate event. My approach to laundry is to fold things a very specific, neat way, while Mr. Pikko opts for the kids to learn to fold their own clothes. Both methods have merit, but when Mr. Pikko lets them do it, I tend to have this overwhelming urge to re-fold their clothes. Although Mr. Pikko will sometimes go to Costco, it’s me that is wanting to go almost every weekend and therefore those awesome days of lunching on samples would slow to a complete crawl unless a Home Depot run was in order! I love going to see a movie, but since adult prices are so high now, the last few times we saw a movie in the theater was just me and the kids. I don’t really mind this at all since it means saving 10 bucks, but were I to suddenly go missing, the kids would see Mars Needs Moms from Redbox. On the weekends, we sometimes have Pancake Day. Since Mr. Pikko doesn’t ever, ever cook, there simply wouldn’t be anymore pancake days. They would instead be replaced by McDonald’s Hotcakes Days. As I mentioned in #3, Mr. Pikko doesn’t cook, so while my kids don’t always eat what I cook, if I went missing it would be eating out or eating Hamburger Helper. Although, I guess Grandma could come by and help cook, but she’s such a mega mom that I’m sure the martians would take her too. In fact, they’d take her on the first ship and put me on the next one for stand-bys. How can this not be #1? Daddy is a great guy to go to for bullies, head knocks, daddy hugs, and broken bicycles, but I’m the one for skinned knees, itchy bites, munchies, and my own special brand of mommy love. We both shower the kids with hugs and kisses and I-love-you’s, but I think they enjoy getting love from both sides. Were one side to go missing, that’d be a pretty big gap to fill.